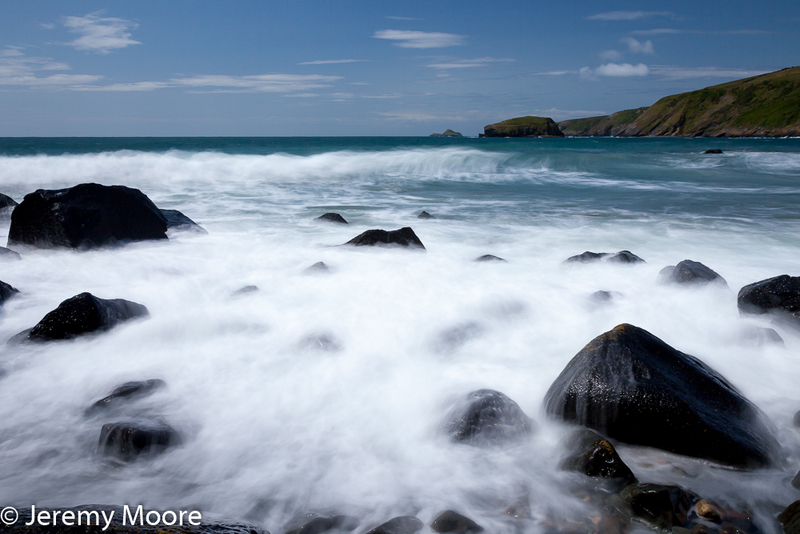 In summer 2011 I discovered Porth Ysgo, a tiny cove near Aberdaron at the tip of the Lleyn peninsula. I was working on Wales at Waters Edge, my book about the Welsh coastline. It took me a while but eventually I noticed that the beach was littered with extraordinary rocks. It wasn’t so much their shape – although there were some interesting ones – but their colour; when wet they were pitch black. 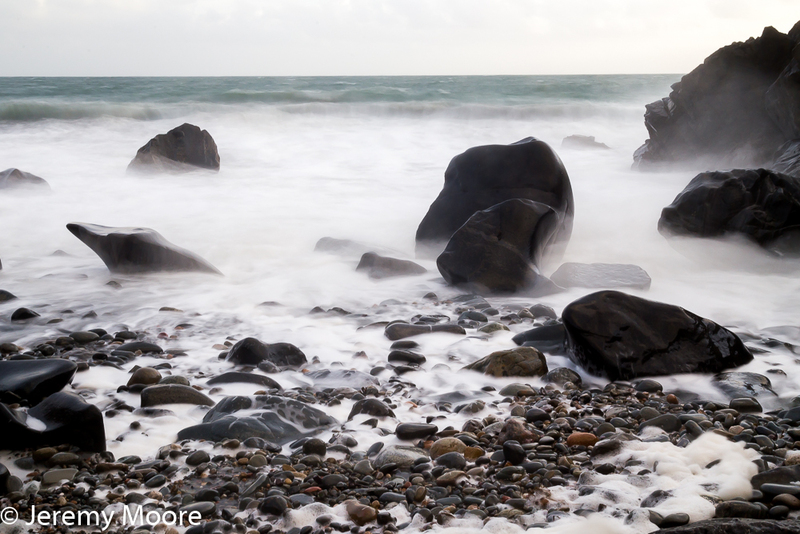 I used a heavy ND filter to slow down the wave motion and create a frothy foam which contrasted strongly with the solidity of the rocks. One picture appeared in the book and I vowed that one day I would go back. Well it took more than six years but I finally made a return visit last week. I met up with my old friend Brian Boothby, a very fine musician and photographer, and it was with a growing sense of excitement that I descended the steep steps down to the beach. Conditions were just about right – a receding tide with a fresh onshore wind. On this occasion I didn’t mind the cloud cover. I put the camera on the tripod immediately, fitted the ND filter and started shooting long exposures. I very rarely use it otherwise but live-view is brilliant in this situation. It gives an “actual exposure” simulation while the image in the viewfinder is virtually invisible thanks to the heavy filtration. It all went well for a while until I noticed that I was getting some massively under-exposed images. I checked all the settings but still no joy. Then I realised what the problem was. Having set a two-second self timer to prevent camera shake, I then took my eye away from the viewfinder. Light entering the viewfinder during an exposure of several seconds was affecting the automatic meter reading by about two stops. In other words, it was cutting the exposure to something like a quarter of the correct one. It seems odd that this should be possible. Can someone explain it? Use live-view to compose the image. Set the self-timer. Wait until a likely looking wave begins to enter the frame. Place the thumb over the viewfinder. Press the shutter. Repeat until it gets dark. In fact, Brian had been exploring and found another tiny cove nearby with more extraordinary black rocks. This time they were larger, more sculptural, and placed randomly on the shore, almost like surreal chess pieces. There were also some massive square-ish blocks, each the size of a small car, piled on top of each other well above the waterline. But salt spray was filling the air. I managed a few more long exposures, then began to enjoy the sheer exhilaration of the conditions as darkness began to fall. Who needs photography on an evening like this? This entry was posted in Uncategorized and tagged coast, coasttline, exposure, exposures, landscape, long, ND filter, photography, wales, Wales at Waters edge. Bookmark the permalink. Hello Jeremy, there is a very comprehensive explanation of light leak here http://www.charlevoixphotographyclub.org/uploads/7/6/5/7/7657490/straylightinviewfinder-rev2_sprevost.pdf. Thank you for the post, I am going to have to visit Porth Ysgo at the first opportunity I can find. Thanks very much for that! I will read and hopefully understand it. Porth Ysgo is a great spot, but nothing will be visible there at a high spring tide, I suspect. I’ll take your advice about the high spring tide and check before I go.